Vincente Minnelli’s reputation is that of a stylist – someone who did not author his own screenplays, but who directed whatever the studio (usually MGM) assigned to him (usually musicals), and whose personal stamp, such as it was, consisted of the choices he made with regard to camera placement, lighting, staging, and décor. Being a great stylist, however, does not mean that a director has nothing to say. Looking at Minnelli’s film career overall – from 1942 through 1976 – I marvel at how often he showed an affinity for metaphysical subject matter: Heaven and Hell (Cabin in the Sky), guardian angels (Yolanda and the Thief), reincarnation (Goodbye Charlie, On a Clear Day You Can See Forever), and otherworldly realms (Brigadoon). If you’re looking for a roadmap to Minnelli’s films, try Dante’s Divine Comedy. The director tends to see daily life as a “Purgatorio” from which we are occasionally granted glimpses of “Paradiso” (Heaven) and at other times dragged into “Inferno” (Hell). The descent into hell turns out to be one of the most frequently recurring motifs in the Minnelli filmography. Meet Me in St. Louis (1944) is Minnelli’s first out-and-out masterpiece, a musical portrait of American family life at the turn of the 19th to 20th Century, with metaphysical undertones. Here, as in so many Minnelli films, the descent into hell is part of an initiation process, something through which a character must pass on the road to self-realization. The descent, a metaphoric one, takes place on Halloween Night. The descender is the family’s second-youngest daughter, little Tootie (Margaret O’Brien). “Inferno” is invoked by shots of a raging bonfire where Tootie and her fellow trick-or-treaters gather. Tootie’s initiation – her descent – takes the form of knocking on the door of her most-feared neighbor and then throwing flour into his face, which she does, before screaming and running away. By the time the film concludes, Tootie and her family will realize they have been living in “Paradiso” all along – if only they had known how to look. Heaven and Hell are states of mind. In Minnelli’s musicals, “Paradiso” is most often invoked in dance sequences where partners achieve a perfect communion through movement. The most striking example would be Fred Astaire and Cyd Charisse’s “Dancing in the Dark” in The Band Wagon (1953). There are similarly sublime sequences, involving Astaire or Gene Kelly, in Ziegfeld Follies (1945), An American in Paris (1951), and Brigadoon (1954). The other side of the coin, Minnelli’s descents into hell, include his famous nightmare sequences – Judy Garland’s dream in The Pirate (1948) where she envisions Kelly as “Mack the Black” surrounded by Inferno-like flames, or the “Coffee Time” nightmare in Yolanda and the Thief (1945). If you remember anything about Father of the Bride (1950), a non-musical, you probably remember Spencer Tracy’s hellish nightmare where he sees himself sinking as if on quicksand while attempting to walk the aisle on his daughter’s wedding day. Minnelli’s films also have real-life hells. In An American in Paris, Hell is the decadent black-and-white party that all the characters attend just before the film’s conclusion. Gene Kelly’s character escapes that hell through a subjective vision – the “American in Paris” ballet which includes his Paradise-like dance by the fountain with Leslie Caron. Having descended into Hell, followed by a vision of Paradise, he returns with the spiritual strength to leave his corrupt surroundings, taking Caron with him. The Band Wagon gives us a satirical vision of Hell – a pretentious theater director (Jack Buchanan) stages a musical version of “Faust,” complete with red spotlights, smoke bombs, and leaping paper flames. Minnelli never abandoned the musical entirely, but in the 1950s, he gravitated to more realistic forms, e.g., melodramas. Tea and Sympathy (1956) was an adaptation of a stage play about a college boy (John Kerr) with gender issues. 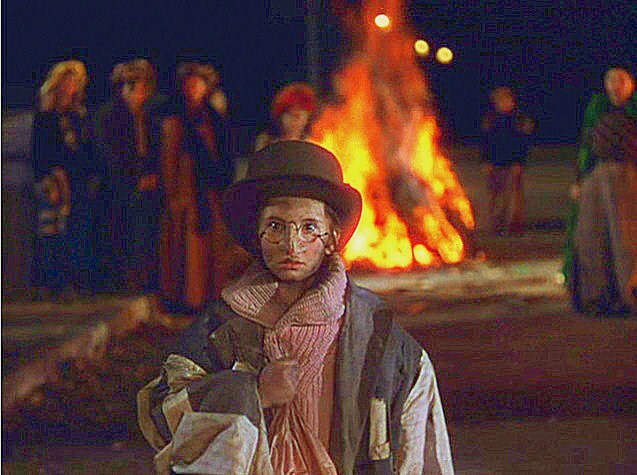 Prior to being initiated into heterosexual adulthood, he is forced to attend a frat boy “hell night” involving a bonfire that recalls Tootie’s descent into hell in Meet Me in St. Louis. Kerr also stars as a neurotic in Minnelli’s ensemble drama, The Cobweb (1955), in which his descents into hell take the form of nervous breakdowns. Minnelli’s personal favorite of all his films was Lust for Life (1956), a biography of the artist Vincent Van Gogh. Vincente the filmmaker clearly identified with Vincent the painter, who makes the Minnellian descent into hell at least three times during the course of this film. Vincent’s first descent is into the actual physical hell-on-earth of a Belgian coal mine, where he ministers to the coal miners. His second descent is into a purely psychological hell, a breakdown that climaxes with the artist severing his own ear. His third and final descent is a shotgun suicide in a field ablaze with sunlight, surrounded by screaming crows. Minnelli’s two movies about filmmaking, The Bad and the Beautiful (1952) and Two Weeks in Another Town (1962) give us two matching descents into hell. Both movies star Kirk Douglas (who also played Van Gogh) as an intensely creative filmmaker. In both movies, the descent consists of someone driving their car maniacally at breakneck speed. In The Bad and the Beautiful, it is a frenzied Lana Turner. In Two Week in Another Town, it is Douglas, with a scared-out-of-her-wits Cyd Charisse beside him in the passenger’s seat. Two Weeks in Another Town ups the ante by preceding Douglas’s suicidal drive with a hellishly decadent Roman party straight out of La Dolce Vita. The characters Minnelli identified with were generally artists or performers of some kind, or – if not actually artists – highly imaginative individuals like Tootie in Meet Me in St. Louis, or Emma in Madame Bovary (1949). The archetypal artist in Western mythology is Orpheus, and the essence of the Orphic myth is his descent into Hell to rescue his lover, Eurydice. On their way to the upper world, Orpheus makes the mistake of looking back – he was warned not to do so – and Eurydice is lost to him. As artists, Minnelli’s protagonists are constantly reenacting variations on the myth of Orpheus and his descent. The Minnelli film that most closely follows the Orpheus myth is also most likely his finest, Some Came Running (1959). The artist in this case is a novelist played by Frank Sinatra. His Eurydice is a bar girl played by Shirley MacLaine. At the film’s climax, the two of them descend into the most brilliantly realized of all of Minnelli’s hells, a nighttime carnival illuminated by infernal flashes of red and orange. Death (a stalker) follows them there, and MacLaine/Eurydice ends up taking a bullet on Orpheus/Sinatra’s behalf. The ending of Some Came Running closely parallels the ending of An American in Paris, only in American in Paris, the Orpheus figure (Gene Kelly) succeeds in rescuing his lover (Leslie Caron) from her worldly hell. Minnelli’s first credited film, Cabin in the Sky (1943), contains his most audacious variation on the Orpheus myth, a reversal of genders (another recurring Minnelli theme) in which a wife, Petunia (Ethel Waters), descends Orpheus-like into a hell-on-earth to rescue her husband, Little Joe (Eddie “Rochester” Anderson). In Cabin in the Sky, we get to see the actual Hell – with demons – and an actual Heaven – with angels, but the hell-on-earth I am talking about is a bar, Jim Henry’s, portrayed by Minnelli as a raucous den of iniquity. Petunia, a good Christian woman, would never ordinarily enter a place like this, but she does so – dressed and acting like a “sinner” – in order to redeem the soul of Little Joe. And she, too, succeeds. How remarkable it is to see a master filmmaker expressing so many of his basic themes so fully in his first feature. This post is dedicated to Eugenia Dillard with whom I have had many conversations over the years concerning these aspects of Minnelli’s work.